The next box of cigars you purchase might have a stamp of a cigar-toting patriot affixed to it, but don't put your cigars in the mail just yet—it's not from the postal service. "The Stamp" is from Cigar Rights of America, a national advocacy organization whose mission is to to protect the rights of manufacturers, retailers, and consumers of premium cigars. The group will begin to include its logo in stamp form on cigar boxes from premium cigar manufacturers that support the organization's cause. "We wanted to develop a program to recognize those companies that have been and are advancing the cause of CRA as a movement among patrons of great premium cigars, for their resources that have advanced the legislative agenda of CRA in Washington and across the nation, and are giving to this partnership between the manufacturers, community retail tobacconist and consumers of premium handmade cigars," CRA executive director J. Glynn Loope stated. Coupled with CRA's legislative agenda and community building endeavors, CRA is also currently involved in a lawsuit against the FDA for what it claims to be a federal regulatory oversight of premium cigars. 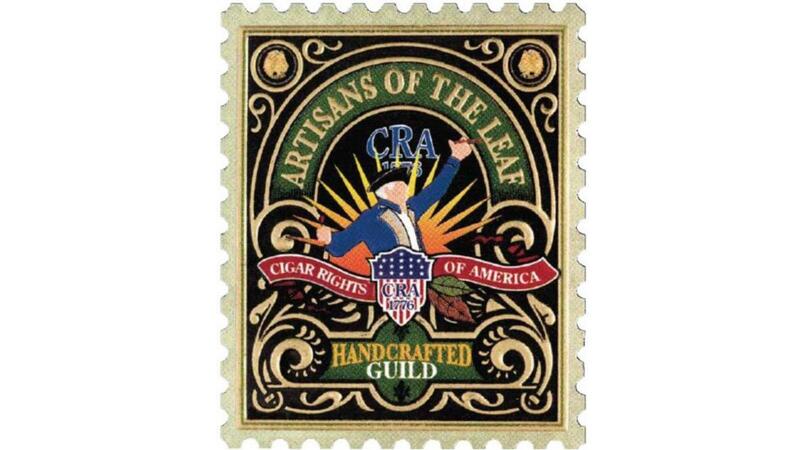 CRA will debut the "The Stamp" and other related promotional material at the International Premium Cigar and Pipe Retailers trade show next week in Las Vegas. "LFD is pledging two cents to the CRA from each cigar we sell in the U.S.," Litto Gomez, co-founder of La Flor Dominicana cigars told Cigar Aficionado. "[The stamp] is symbolic of what each company is doing to protect our rights to smoke."